Why Do Third Party QA/QC? • Ensure that the fabric filter bags you receive meet the detailed specifications. • Maximize your fabric filter bag life. • Minimize baghouse pressure drop. • Protect your fabric filter bag set. • Provide documentation in case of litigation. For decades ETS has been deeply involved in conducting filter fabric and filter bag QA/QC programs to ensure that end users receive the best fabric filter bags possible when ordering a replacement fabric filter bag set. This translates into a filter bag set that will ultimately yield the greatest bag longevity. 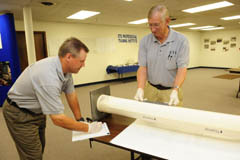 In the event that you may be considering a fabric filter bag replacement project at your baghouse facility, the goal of attaining the longest fabric filter bag service life available is best accomplished by a rigorous quality assurance plan that would help protect YOUR interests. 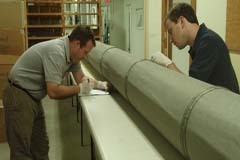 Regardless of whether you are replacing hundreds or thousands of fabric filter bags, by conducting an independent, 3rd party Quality Assurance/Quality Control program, you can document that your filter fabric and bags are manufactured according to the correct specifications and requirements (strengths, flows, construction, etc.) and with the quality and workmanship you expect and have paid for, because without that documentation, there is relatively little recourse when the fabric filter bag set does not realize its life guarantee once it is placed in service. A single hole in the filter fabric or a single patch of missing membrane can ruin an entire fabric filter bag set. These bag failures lead to dust on the “clean side” of the tubesheet which ultimately leads to shorter fabric filter bag life, higher emissions, and can even result in reverse side bag blinding. What does a QA/QC Program Consist of? • Detailed filter fabric and filter bag specifications. • Testing of filter fabric, membrane, stitching thread, finished bags, cages, caps, rings, and bag fit. • Filter fabric strength, pressure drop, flow, filtration, and construction. • Procedures for handling, storage, and shipping of fabric filter bags. • Continued fabric filter bag monitoring. 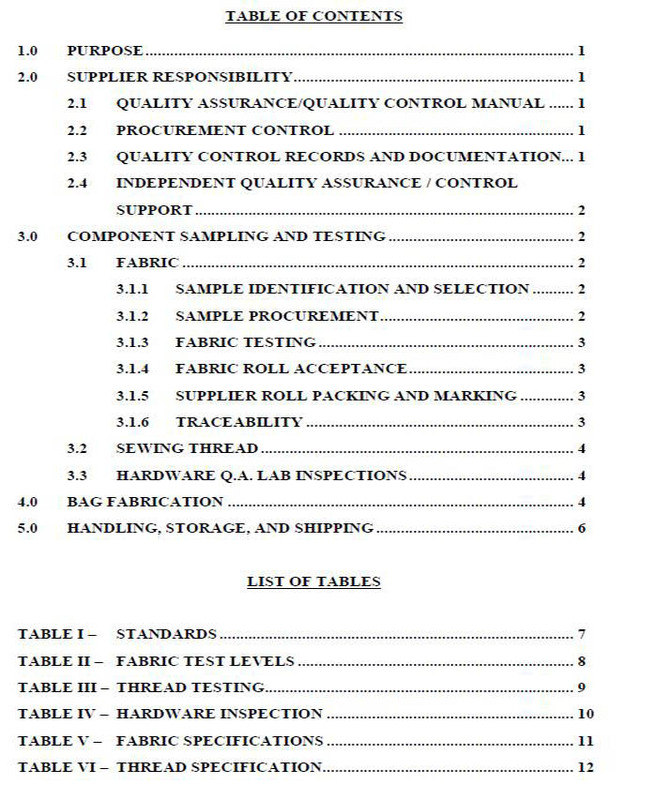 One of the often times overlooked benefits of executing a fabric filter QA/QC program is that the people who are directly involved in manufacturing the bags are aware that an unbiased party is, or may be, looking over their shoulders and randomly checking materials and construction. Then, their workmanship during the fabric filter bag construction and fabrication stages is usually of utmost quality. To you this ultimately equals a better product and longer filter bag life. In a Quality Assurance fabric filter bag testing program, minimum acceptable tolerances and written specifications for the fabric, thread, hardware and constructed fabric filter bags are documented and agreed to before construction, and delivery of the final bag set is dependent upon tested results. Specifications are required to protect YOUR interests, and fabric filter bag manufacturers fully realize they are accountable and responsible to correct any items which do not meet minimum specifications. Considering all the cost you will have invested in a new fabric filter bag set, including the bags, hardware and installation labor, not to mention maintenance and rebagging costs, additional down time, and the potential exceedances of permitted allowances if more than just a few of those (new) filter bags fail prematurely, a fabric filter Quality Assurance/Quality Control program is a great value for the service and protection it provides. • The level of sampling and testing is your choice. Note that each QA/QC program is customized to accommodate client needs. 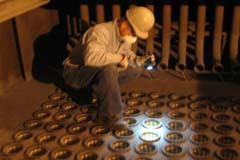 Utility and Industry QA/QC references available.